Rosenberg’s Gladiator Tree Frog is one of Panama’s largest amphibians, 70-90 mm in length! It gets its name “gladiator” from the sharp spikes on its hands and combative behavior during reproduction. Rosenberg’s Gladiator Tree Frog is easily and quickly distinguished from other tree frogs by its large size and a distinct thin black stripe from the snout to the middle of its back. Furthermore, it has a protrusion at the base of its thumb called a prepollex, tipped with a spine, which is most pronounced in males. 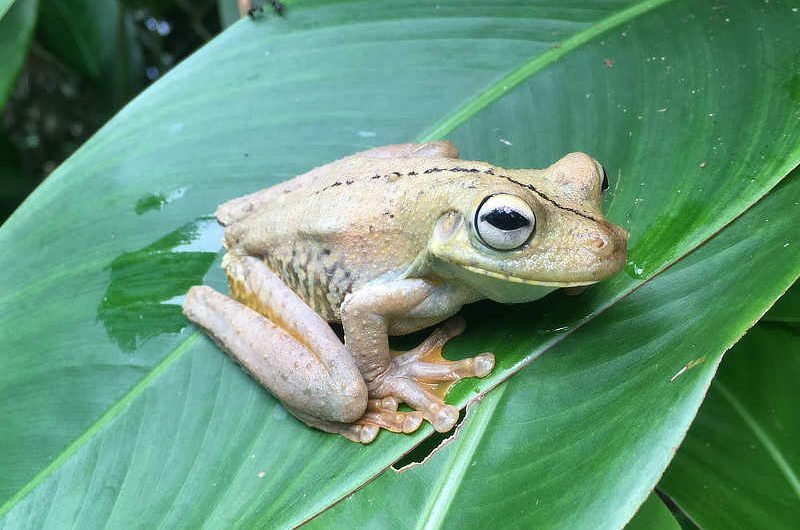 Overall, Rosenberg’s Gladiator Tree Frog is mottled creamy to tan, brown or reddish brown on its upperside, with a creamy or white underbelly, chest and throat. It has relatively smooth dorsal skin, but granular toward the hind limbs. Like other tree frogs, it has enlarged disks on its fingers and toes, and substantial toe webbing, brownish-yellow to orange in color. Eyes are large, silvery-whitish with a horizontally slit pupil. It has a large round eardrum. Males are usually darker and more distinctly marked than females. Females are larger and more uniformly colored. As their name suggests, these frogs are arboreal, spending their time in the forest canopy, especially during the dry months of the year. When the rains start in May, they descend to the ground to breed. They have a very prolonged breeding season, but main periods of reproduction coincide with the end of the dry season in April and May, and the end of the “veranillo” (“little summer”) in July and August. When the conditions are good, the male searches for nearly dried-up bodies of water. He positions himself on the edge of the pool and scoops out the sediment, forming a bowl-like depression up to 30 cm in diameter. This fills with water, creating his own artificial pond, which is where he sits and sings to attract females. The male’s calls are very loud and can be heard from a great distance. These low, short notes sound like a stick hitting a hollow log. Males can be heard calling throughout the year, and in Darien, they will even breed in the dry season. When a female approaches, she inspects the nest, often with great care. She may bump the male and rub his skin, indicating her approval of his nest. The male climbs on her back and the pair engage in amplexus. He clasps her armpits with his prepollical spines for better grip! The female releases eggs onto the nest’s water surface, forming a floating layer, and the eggs are immediately fertilized by the male. The female lays 500-1200 eggs in the nest. During these crucial few days, the male attends and aggressively defends the eggs during their development. There is a big risk that intruders, particularly other male Rosenberg’s Gladiator Tree Frogs, will attempt to break the nests’ water surface tension, causing the eggs to sink to the bottom of the pool and drown. Males will fight aggressively, and use their prepollical spines to damage the eyes and eardrums of the other. These fights are very serious and can be fatal. In areas where there is plenty of good habitat and abundant food, there is less competition and less fighting among male frogs. Eggs hatch in 2-3 days, and tadpoles take up to 40 days to complete metamorphosis. Rosenberg’s Gladiator Tree Frogs reach maturity in about a year, and most adults do not survive more than one breeding season. Rosenberg’s Gladiator Tree Frogs feed on arthropods, particularly spiders and crickets. Tadpoles are known to be cannibalistic, and will eat eggs and smaller larvae. Adults are predated on by caiman, snakes, small mammals, turtles and herons, and even other larger frogs. Rosenberg’s Gladiator Tree Frogs range from the Pacific lowlands of Costa Rica and Panama to northwest Colombia and Ecuador. They inhabit lowland humid rainforest, primary and secondary forest and even adapt well to disturbed areas. Rosenberg’s Gladiator Tree Frogs are common around the Canopy Tower and especially Canopy Camp Darien, on occasion spotted sleeping on rocks or tree trunks, or at night in our outdoor showers! Would you like to learn more about Panama’s amazing herpetofauna? Join us for our Herpetology at the Isthmus Tour!